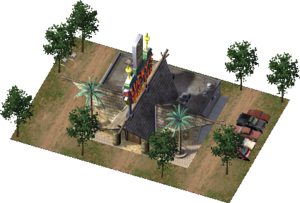 Lucky's Hang Ten is a downloadable Landmark Building for SimCity 4 Rush Hour/Deluxe, released as the Plugin Pack 036 free Downloadable Content. Unlike most of the other DLC Landmarks, this building is completely fictional. Lucky's Hang Ten shares almost all of its building properties with Sobchak Lanes and the Rockefeller Center, the latter of which was probably a mistake. It's also one of only a few DLC buildings that have no files for a language other than US English, a trait it shares with Sobchak Lanes.